Pasay City Local Government Unit has given financial assistance to 10,999 Pubic Secondary Schools’ student-beneficiaries. The amount of 1,500.00 which covers the first three months of the quarter was distributed to each student on July 28,2018 and August 4,2018 respectively. During the launching of the program held at Pasay City West High School on July 28, 2018 Mayor Antonino G. Calixto spearheaded the distribution of allowance together with Congresswoman Imelda Calixto Rubiano and the members of the City Council. Representing the Division of City Schools are the top officials headed by Dr. Evangeline P. Ladines, Schools Division Superintendent, Dr. Melody P. Cruz OIC-Assistant Schools Division, Mr .Librado F. Torres, Chief Education Program Supervisors. Also present are School Heads, Assistant Principals, teachers, student-beneficiaries and their parents. 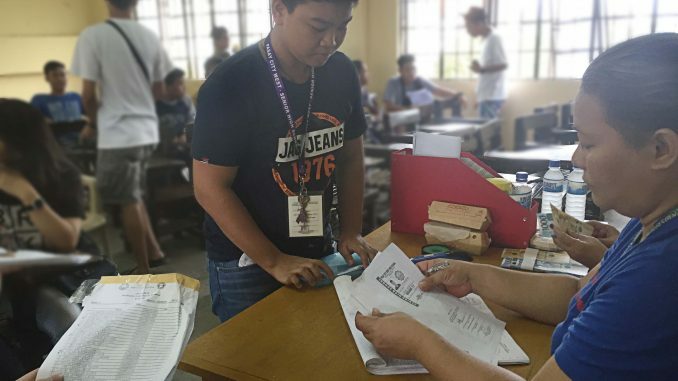 In his message, Mayor Calixto emphasized that the financial assistance program was in accordance with the City Ordinance No, 5886, s.2018 –“An Ordinance Providing for the Implementing Rules and Regulations As Regards the Grant of Monthly Financial Assistance to Public Secondary School Students in Pasay City Effective School 2018-2019 Subject to Compliance with All Applicable Laws, Rules and Regulations on the Matter. “This mandates the city government to provide a monthly allowance of 500 pesos to each public high school students and Alternative Learning System ( ALS) learners in Pasay. He stated that the program will give opportunity to the city government to share the benefits to the students. He further stressed the importance of Education as a means to eradicate poverty. Dr. Ladines, commended the Local Government Unit for financial subsidy given to the students. Accordingly, this is aligned to DepEd’s strategic goal number 1 which is the “Education for All”. She added that the partnership of DepEd and Local Government Unit marked another milestone which will increase participation and completion rate of the schools. She concluded and enjoined everyone to work together towards the attainment of the city’s dream, “To make every learner in Pasay a productive citizen”. Meanwhile, simultaneous distribution of financial assistance commenced August 4, 2018 at Pasay City East High School, Pasay City South High School, Kalayaan National High School, President Corazon Aquino High School, Pasay City North High School-Tramo and Pasay City North High School-M. Dela Cruz. Good day we want to know the requirements to avail the financial assistance my son is studying in Pasay South High School thanks po he is already in 3rd Year Level.